Get up to €100 bonus cashback and 5 LV Spins on Hotline™! We all need some back-up once in a while. No different for our gaming adventures as Lady Luck does not shine every day on the reels we are spinning. 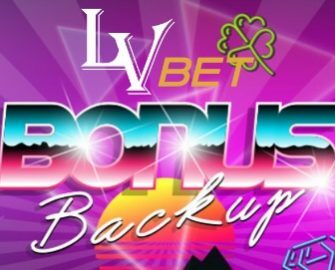 Good thing that LVbet has a special reward for all players who wager on Play’n GO and GF Games slots during Sunday as they will receive a 20% bonus cashback on Mondays if they are not lucky on the reels. Plus, all depositors will receive instantly 5 LV Spins on Hotline™. Play on any BF Games or Play’n GO slot this Sunday at LVbet and get rewarded with a generous cashback bonus if Lady Luck is not on your side. Any net losses by midnight on Sunday will be eligible for a 20% bonus refund, up to €100. Minimum loss on the selected games in order to qualify for this promotion is €20. Only losses made in real cash will count towards this promotion. The bonus is calculated on players’ real money net losses (total real money bets – total real money winnings). Any bonus back-up owed will be applied by 17:00 on 11th June 2018, with a maximum amount capped at €100. Only losses made on the selected slots will count towards the bonus back-up offer. This offer cannot be claimed in conjunction with any other bonus. Wagering requirement is 35x bonus amount within 15 days, subject to the LVbet bonus terms and conditions. All players using the BONUSBACKUP code when depositing, will receive instantly 5 LV Spins on Hotline™. They can simply open the game after the deposit is completed to enjoy their reward. Wagering requirement is 35x LV Spins winnings within five days, subject to the LVbet bonus terms and conditions.